A fair housing group is suing a second mortgage lender, alleging that U.S. Bank takes much better care of its foreclosed properties in predominantly white neighborhoods than those in minority communities. The National Fair Housing Alliance has filed a discrimination lawsuit against U.S. Bank, as a result of a study by the civil rights group into the way banks maintain the properties that they've foreclosed on (also known as real estate-owned or REO properties). It follows last week's NFHA lawsuit alleging the same discriminatory practice by Wells Fargo, and comes as the group reportedly is in discussions with Bank of America over the upkeep of its properties. 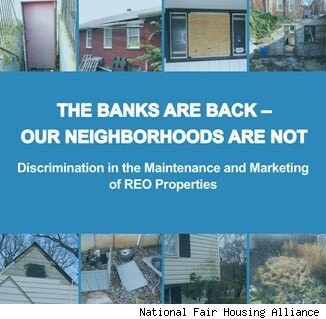 The NFHA said in a statement: "The investigation of 177 foreclosed properties owned by U.S. Bank demonstrates that the financial giant has engaged in a systemic practice of maintaining and marketing its foreclosed, bank-owned properties in a state of disrepair in communities of color while maintaining and marketing REO properties in predominantly white communities in a far superior manner." Through a spokeswoman, U.S. Bank, which the NFHA says is the fifth largest commercial bank in the U.S., told AOL Real Estate that it has "not received a single detail on any of the properties in the complaint. Without knowing the addresses, it's impossible to know the rightful owner, the servicer or the condition of the property." U.S. Bank spokeswoman Nicole Garrison-Sprenger went on to say in an email that in the "vast majority of cases" in which U.S. Bank is involved in a foreclosure, it serves as a trustee for an investment pool that encompasses the failed mortgage, and has "no role in servicing or maintaining that property." "That is the responsibility of the servicer (typically another bank), and not the trustee," Garrison-Sprenger said. "It is often the case that we are mistaken as the owner of a property because of our role as trustee." According to NFHA President Shanna Smith, the civil rights group intends to file similar lawsuits in the coming months targeting not just additional lenders, but also asset managers and preservation companies tasked with maintaining foreclosed properties. But Smith indicated that the NFHA may also hold off on legal action if lenders demonstrate a willingness to work with the organization to resolve the maintenance inequities, pointing to Bank of America as an example. The lender reached out to the NFHA in January after catching wind of the NFHA's investigation, she said. "We decided we'd talk with them to get this resolved," she said of Bank of America. "At this point we're trying to work through everything in a partnership way, rather than through a formal complaint." Some of the properties looked at by the investigation are owned by the Federal Housing Administration, she said, and in order to rectify their neglect, the NFHA may sue contractors hired by the FHA to maintain foreclosed homes. "As we look at FHA properties, we're finding some of that negligence," she said. Examining over 1,000 bank-owned properties, the nonprofit's study focused on a wide array of maintenance and marketing indicators, "including curb appeal, structure, signage, indications of water damage, and condition of paint, siding and gutters," to draw conclusions about maintenance standards. "REO properties in communities of color generally appeared vacant, abandoned, blighted and unappealing to real estate agents who might market the unit to homebuyers," the report from the NFHA reads. "On the other hand, REOs in white communities generally appeared inhabited, well-maintained and attractive to real estate agents and homebuyers." Gerardo Ascencio, president of the National Association of Hispanic Real Estate Professionals, praised the efforts of the NFHA, alleging that banks' neglect of foreclosed homes in minority areas is a "widespread industry problem." "Our view is that this issue is not exclusive to one or two lenders but an an industry-wide issue with tremendous opportunity for improvement across the board," he told AOL Real Estate. "We applaud NFHA for bringing this important issue to light." Banks have, in the aftermath of the housing meltdown, repeatedly come under fire for discriminating against minorities. A study from the Center for Responsible Lending, for example, found that blacks and Hispanics with credit scores above 660 received subprime mortgages three times as often as whites with the same rating. And allegations that Countrywide charged 200,000 minority borrowers higher rates and fees than whites led to a historic $335 million discrimination settlement between its parent company, Bank of America, and the Justice Department. In the wake of a housing crisis that caused around 4 million Americans to lose their homes to foreclosure, banks have taken on ownership of swarms of those properties. Foreclosures have pushed down prices by swelling the general supply of homes and sometimes selling at steep discounts. Failing to maintain the homes, which already are a drag on property values by virtue of being foreclosures, is generally seen as adding to their negative impact on neighborhoods. The new report, the NFHA said in a statement, now "offers disturbing evidence that the same banks that peddled unsustainable loans to communities of color and triggered the current foreclosure crisis are now exacerbating damage to those communities."